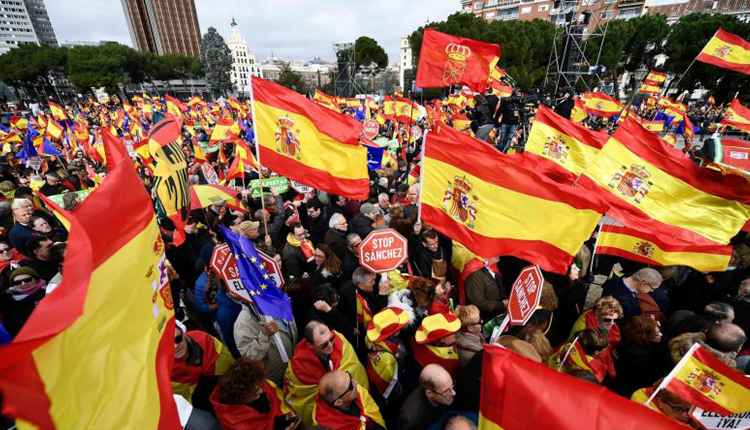 Tens of thousands of people waving Spanish flags joined a rally on Sunday in Madrid called by right-wing and far-right parties against Prime Minister Pedro Sanchez over his negotiations with Catalan separatists. Under the shadow of a huge Spanish flag that flies above the central Colon Square, the demonstrators waved their own smaller red and yellow versions of the same banner and held signs reading “Stop Sanchez. Elections now!”. They are angered by Sanchez’s decision to take a more conciliatory tone with pro-independence parties, whose votes are crucial to the legislative agenda of his eight-month-old minority government. “The government of Sanchez’s time is up,” PP head Pablo Casado told reporters before the start of the rally. They called the rally after Sanchez’s government last week accepted the presence- as asked by Catalan separatists- of an independent “rapporteur” in future talks between Catalan parties. Despite the government’s concession, Catalan separatist parties still refuse to back the government’s 2019 budget. If Sanchez is unable to approve his budget, he could call elections before his term is over in 2020.